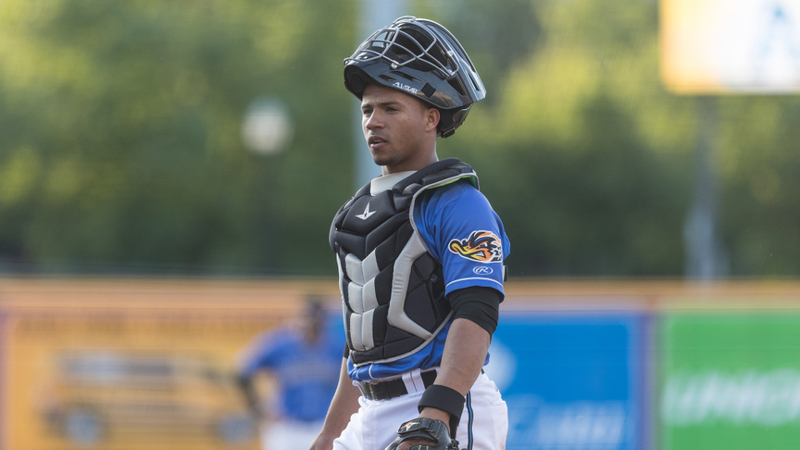 Portland, ME - The Eastern League of Professional Baseball is pleased to announce that Akron RubberDucks catcher Francisco Mejia has been selected as the 2017 Eastern League Rookie of the Year. Mejia made his Double-A debut with Akron this season after combining to hit .342 with 11 home runs and 80 RBIs in 102 games between the Lynchburg Hillcats of the Carolina League and the Lake County Captains of the South Atlantic League in 2016. The 21-year old continued to build on that success with the RubberDucks this season, batting .297 (103-for-347) with 21 doubles, two triples, 14 home runs, 52 RBIs, 52 runs scored, seven stolen bases, a .346 on-base percentage, and a .490 slugging percentage in 92 games. Francisco was rewarded for his performance in Akron this season with a promotion to the Cleveland Indians on September 1st. Mejia, who is a native of Bani, Dominican Republic, was ranked among the Eastern League leaders in batting average (.297-tied 6th), slugging percentage (.490-8th), and OPS (.835-8th) at the time of his promotion to Cleveland. Francisco also led all Eastern League catchers in assists (86) while throwing out 30-percent of would be base stealers, which ranked seventh among all catchers in the league. The 5'10", 180 lb. slugger was selected as the catcher on Eastern League All-Star Team, won the Eastern League Player of the Week for the period of June 5th-11th, was chosen as a member of the World Team at the 2017 MLB Futures Game in Miami, and was named to the Western Division roster for the Eastern League All-Star Game in New Hampshire. Francisco, who is rated by MLB.com as the top prospect in the Cleveland organization and the 16th best prospect in all of Minor League Baseball, was signed by the Cleveland Indians as a non-drafted free agent on July 2, 2012. Trenton Thunder middle infielder Thairo Estrada finished second in the voting for the Rookie of the Year Award and Reading Fightin Phils outfielder Carlos Tocci finished in third place. This award was voted on by Eastern League managers and coaches and members of the media.